“It’s so beautiful, just like Scotland!” I often recall this comment, made by a fellow teacher on my first trip to Central America. I was with a small group promised a tropical rainforest experience in Honduras. I had never felt so out of place in my life. As she made this rapturous exclamation, I was on the verge of tears. Didn’t she realize where she was? Turned out her comment, made early in the trip, was prophetic. We never did get into any rainforest. Deforestation was so extensive that our group leaders couldn’t find any for us to see. The comparison with Scotland wasn’t all that bad, in fact. The gentle mountains we saw as we traveled along the highways were covered in rolling pastureland with scattered cattle. I’ve learned since then that for each hamburger produced from tropical cattle, 55 square feet of rainforest is sacrificed. I’ve also become vegetarian since that trip. I tried to make the best of it. I realized that to salvage what rainforest experience I could, I would have to take every available opportunity to explore whatever remnants of forest I could find. My hope was that if I saw enough and got lucky, maybe the sights could blend together over time into the rainforest experience I had hoped for. I did see a big tree! It was a Ceiba tree, roughly eight-feet wide at mid-height, with buttress roots towering twice my height above the forest floor and expanding easily to a circumference of 80 feet at its base. It was four-hundred-years old, with a spreading canopy covered by orchids, bromeliads, and hanging vines. I remember the tree well because to enjoy it I had to really focus on it. You see, it was on a nature trail with open fields 100 yards away. I also had to put my fingers in my ears. Otherwise I could hear the sound of workers hammering in the distance. I tried to imagine (with limited success) hundreds of trees like this, scattered through a humid rainforest, lush and beckoning. A few hundred miles away on another nature trail, I came upon a group of white-collared manakins. These birds, roughly robin-sized but stubbier, with bright yellow breasts and white throats, treated me to a mating display that I won’t forget. Each male uses its wings to sweep clear for himself a circular patch of the forest floor roughly three feet across. A dozen or so males may set up these neatly manicured territories in an area about one-half acre in size. When a female comes along, the males immediately respond by hopping up on tree branches and making loud snapping noises with their wings. They actually pop some bones as you might do while cracking your knuckles. The pops are followed by whirs caused by the vigorous fluttering of their wings. The best snapper in the group gets the benefit of mating with as many as 95 percent of the females that come by. It was a thrill to get swallowed up in their snaps, crackles, and pops. 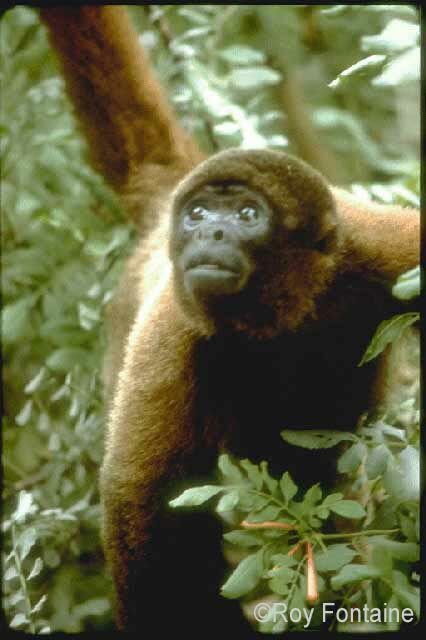 The area was also inhabited by Black Howler Monkeys, and they provided me with another memorable experience as I walked a trail with a guide and another teacher, Mark. Again, we had to try to forget the farmers’ fields that were only yards away. We put blinders on and focused on the howlers that were scattered in a narrow, but fairly well-developed forest that meandered along a winding river. As we wandered along, we unknowingly approached a Howler group high in the trees. Before seeing them, Mark confused us by calling our attention to some “rain” falling from above. Other than the darkness due to the canopy overhead, there was little to suggest that a storm was approaching. A quick look into the trees, however, clarified the matter. The “rain” was coming from the monkeys. Monkeys often do this, as well as hurling feces (yep, they did that too) when threatening invaders enter their territory. The moment was only spoiled by my jealousy of Mark; I wanted the experience of first discovery, even if it meant getting sprayed and splatted. Another adventure took place while walking through yet another forest patch, this time with houses actually in sight. I came upon a basilisk lizard. Locals call it the Monkeylala, or the Jesus Christ lizard. This particular one, small at roughly 10 inches, was resting between me and a small stream. It gets the latter name because when chased and surrounded by water, the Jesus Christ lizard will often stand up on its hind legs, and with its long webbed toes, quickly run across the water without sinking. What a treat! I turned slowly to get a better look, but spooked him. The basilisk tore away and raced upright across the surface of the stream, toes flailing wildly, head held high in the air. My next thrill came when I was walking alone along a botanical garden trail. Here, in a flourishing jungle, I got closest to the feeling of being in a virgin rainforest. The huge leaves that arched from the plants throughout the garden made me feel small. The effect was lessened somewhat by the fact that many of the plants were growing from pots scattered along the paths. But I found that if I kept my head up at the right angle, I couldn’t see the pots. I was walking along and looking up when a sudden rustle in the leaves above me made me jump. A vine snake was just in front of me! I was astonished at its shape. Although close to three feet in length, it was almost pencil-thin. The snake looked like one of the hundreds of vines that were tangled throughout the bush. As the snake slipped away, it held its tongue rigidly straight out, like it was stuck. What a hoot! Why would the snake do this? Possibly sticking out its tongue was a desperate attempt to make its widest and most conspicuous end look more like part of a vine. But the effect gave me a good laugh. I started recording all of these separate experiences in my journal. I tried to appreciate each one for what it was. I never saw a scrap of virgin rainforest, but I did see mature rainforest trees, draped in vines and lush lianas. I did have 16 close encounters with tropical wildlife, and for that I was very grateful. I hoped that, in time, if I was able to forget the roads, the fields, and the construction that always seemed to intrude, then the snapping manakins, the huge Ceiba tree, the Monkeylala lizard, the slinky vine snake, and the rude Howlers would merge in my mind to give me the rainforest experience I was after. I was left to wonder what else there was to see, and what else won’t be seen if deforestation continues at its current pace. There are no simple solutions to this problem. Honduras’ current population of 7.2 million is projected to hit 12.6 by 2050. Sixty-four percent of Hondurans live in poverty. What can be done if there is money to be made by selling timber and raising cattle? A short list would include not buying rainforest wood products, eating less meat, supporting sustainable agricultural ventures like shade-grown coffee, funding international family planning programs, and providing educational opportunities for women to help lower birth rates and increase family income. A tall order, but doable if we acknowledge the problem and act now. I just finished writing a long chapter about the giant meatpacking corporations Tyson and Smithfield for the new book. I learned a lot researching the chapter. Learned a lot about why the meat industry loves North Carolina so much. Only 3.8% of NC workers are unionized, the lowest percentage in the industry. So NC provides cheap labor. We also have the highest rate of increase in the numbers of immigrant residents, who are ideal employees for the dangerous meatpacking industry, from the corporate perspective. Between 1990 and 2000, NC has seen an increase of 273% in the numbers of immigrants who settle here. Most are Latino. The Smithfield slaughterhouse in Tar Heel NC is the world's largest meatpacking plant for hogs, processing 32,000 hogs per day. More than half of the 6,000 employees at the Smithfield slaughterhouse are Latinos, many undocumented. When immigrant workers object to speeding up the processing line, because it increases the risk of injury from the sawblades, they're just threatened with deportation. Or fired. Many can't speak English, and no one wants to be deported, so no one complains. The story with Tyson is similar - it'll all be in our new book, with details. Tyson is the world's largest poultry producer, raking in an astounding $26 billion a year in revenue. Here's the really scary part. The president of Smithfield says he has plans to make Poland "the Iowa of Europe." (Iowa is the only state in the US that has more hogs than North Carolina.) And John Tyson, CEO of Tyson, said in 2005 that Tyson sees the expanding market for meat in China as the source of Tyson's profits in coming years. They've saturated the US market, now they're exporting the factory farm model abroad. Between the two of them, Smithfield and Tyson already have factory farms up and running in more than a dozen countries. China, the world's most populous nation (1.3 billion people, compared to our 298 million), already has 14,000 factory farms. But only 15% of their meat is coming from factory farms. So China is a field waiting to be plowed by the likes of Smithfield and Tyson. So much to plunder....they're drooling at the prospect of mo mo money for their stockholders and executives. They're going after the developing nations, where, you guessed it, labor is cheap and non-unionized, and environmental laws that might impede waste disposal are slack. Where do the animals' rights fit into this scenario? At the very very bottom. What's to be done? Tell other people what you know. Write a letter for the editorial page of your newspaper. Write letters to the executives of Smithfield and Tyson. At the very least, don't buy Tyson or Smithfield products at the grocery. Although the other giant poultry producers, Perdue, Pilgrims Pride, GoldKist, are all up to the same thing. The ultimate solution is for all of us to avoid buying products from these factory farming corporations. Eat plant-based foods. If you do eat animal products, buy them from local providers who use humane and sustainable methods. Check www.localharvest.org or www.eatwild.com for help in locating pastured animal products in your area. Or ask at your local natural foods store or farmers market. In North Carolina, contact Carolina Farm Stewardship Association at www.carolinafarmstewards.org. In Georgia, contact Georgia Organics at www.georgiaorganics.org for help in finding responsible providers. I’ve met so many interesting people lately, folks who choosing to do things differently. Some are environmentalists, some have their own reasons. I’ve been interviewing folks about biofuels, pastured livestock, and green housing choices. And about the timber companies around here that are clear-cutting and turning our Southeastern forests into paper. Corporations that are up to no good! But people all over the place are stepping out of line to try to change the system. I’m inspired and honored to meet the good people my research has led me to in the last year and a half. Last week I interviewed Trip Overholt, who lives in a house whose first floor is straw bale, and whose second floor is made of recycled and salvaged materials. The house is powered by photovoltaic cells in his front yard. He makes his own biodiesel fuel for his truck and his family car. Cool, very cool. Trip’s got it going on environmentally, he’s got it covered from just about every angle. I also interviewed Gary Phillips, another innovative sort of person who built a rammed earth house. I was amazed at his house, the walls were as smooth as plaster, but were made of soil (plus 5% concrete) that had been poured into molds and allowed to “cure.” The house was beautiful. I’m a huge fan of Jim Cameron and Kathleen Jardine’s work as designers of passive solar homes in the Triangle area of NC. They’ve integrated so many different features of green design into their houses, in addition to the passive solar aspect. They’ll have a new web site up soon about their work. I’m grateful to them for educating me about green design and energy efficiency in general. Plus, they introduced me to Trip and Gary and several other people making green choices in the Chapel Hill area, all of whom will be featured in our new book. These are just a few of the folks who are inspiring me lately. I talked to Sara Kate on the phone last night, she's living in Hot Springs in the mts of NC. The population of Hot Springs is 640 people. She and Matt are working as cooks at Elmer's hostel on the Appalachian Trail. They're also living at the hostel. Sara Kate says she can see the trail from the kitchen window. Yesterday was their first day on the job. They made sauted tofu and a pie, among other things. I forgot what kind of pie, and what veggies or bread they made. I guess I wasn't listening very carefully. She sounded tired at 9:00 p.m. when she called. I was distracted by stuff going on here. She has no computer, can only do email at the Hot Springs library which is open 16 hours a week. I'll be visiting them when we do a presentation at Malaprops Bookstore in Asheville on April 6 at 7:00. We'll be doing a panel at Mars Hill College on April 6 too, earlier in the day. And will be interviewed on WCQS radio in the late afternoon of April 4. Something at Warren Wilson College on April 5 I think. And a book signing at Earth Fare, and a pot luck on Friday April 7. I'll put it all on the calendar on the blog as soon as I get the times, and figure out how to put stuff on the calendar. Sara Kate and Matt and Elmer are arranging it all, since they're up there and I'm not. It's gonna be a busy four days. That's probably the last set of appearances we'll do for Veggie Revolution before the next book is finished in June. I can't do promotional stuff and write under a deadline at the same time, it's making me a basket case. I hope to interview Scott Quaranda of the Dogwood Alliance while I'm in Asheville, on the subject of chip mills and deforestation in the Southeast. I want to interview somebody who actually works at a chip mill too, if I can find somebody to talk to me. We're hoping to go by Earthaven too if we have time, to see their earth-bag house. This afternoon I'm going to Chapel Hill to interview Trip Overholt about his PV strawbale house with compost toilets and his biodiesel truck. Tomorrow I'll interview Gary Phillips in Silk Hope NC about his rammed earth house. Yesterday I spent the day writing up an interview with Philip and Sheila Brooks about their pastured cattle business. They live in Union County, raise about 45 cows/steers at pasture. No corn, no hormones, no antibiotics. I liked the Brooks a lot. And their cows. I spent the day yesterday writing about how relatively well-off their cows are in comparison to feedlot cattle. Then when I was talking to Sara Kate she was telling me about the movie Earthlings. She told me to watch it. She said it's about the meat industry, has footage of the kosher slaughterhouses, footage of a pig being killed with a captive-bolt stunner. And so on. She said it was moving, jarring, effective. She says she wants to avoid all animal products now, unless she can see herself how the animal was raised. Like for example, Cassie and Natalie's pastured layers (hens). I need to see it. I need to watch that Wal-Mart documentary too. I want to watch Earthlings then rewrite my chapter about the cattle. Ken, who was kind enough to proof-read for me, said the cattle chapter was way too long anyway, needs drastic revision. Well. Things change. That's what it's all about, growing and learning. If I didn't learn anything from working on the books, then why bother? That's the point really. So. I'm gonna look at the library or amazon for Earthlings and for the Wal-mart documentary, drink more coffee, run to my dresser drawer for a tiny square of chocolate, then work on revising my cattle chapter some, and finally head out of here for Chapel Hill and hope I don't run into a big snag on I-85. Which I usually do. Whoever you are who bothered to read this, I hope you have a good morning and a whole good day. This past week I interviewed Barry Ford in Lancaster SC about the straw bale house that he built with his wife and son, who was then 8 yrs old. The house is 2300 square feet and cost them only $13,000. That works out to $5.65 per square foot! Wow. I'm not sure what usual construction costs are in Charlotte, but I'm told that in Chapel Hill, construction of a conventional house is about $130 per square foot. The Fords had no labor costs, because they did they whole thing themselves. Barry says they used about 30% less wood than a conventional stick-built home. There are no studs in the walls. The water pipes and electrical wires run under the floor, so there's nothing in the walls but bales of straw, laid flat so the walls are 22 inches thick. That's a lot of insulation. The bales are covered with stucco inside and out. They got the bales pretty cheap - Barry said he and his wife drove around in the back country looking for farmers baling hay. When they saw one, they'd stop and ask him if they could buy the bales. They got 50 to 100 at a time, sometimes paying as little as 75 cents, up to as much as $3 a bale. The house now has more than 1000 bales in it. They've had no trouble at all with moisture. He said they actually had to add a little moisture to the bales, because if they're too dry, the straw is too brittle. They have a little moisture meter sticking out of the straw in one of the window wells to keep track of the moisture content, although it hasn't changed. The only place you can actually see the straw is in his "truth window," a glass pane in the wall that shows the straw behind it. Barry says building a straw bale house is cheap, but not if you hire a contractor to do it. The construction of a straw bale home actually takes longer than a conventional house, so the labor costs can be high. The good thing about building with straw bales is that a family of three can do it alone. The only thing the Fords got help with was putting the roof trusses into place, a total of 7 hours of assistance. The house was pretty interesting. Building with straw is a good choice environmentally because straw is actually a waste product. It's the inedible stem of a grain like wheat or rice, after the grain has been removed. Using a straw and stucco wall means you're not using other materials, which require energy to produce and transport. Some wall systems, like OSB board, are toxic. OSB board "offgases" toxic fumes in homes, and creates toxins during manufacturing. The Ford's straw bale home will be one of the green and economical housing choices featured in our upcoming book from Fulcrum, The Power of Your Pocketbook: How Americans' Spending Habits Shape our World.